Run the lime wedge around the edge of a glass and then dip the glass in the coarse salt. Throw your lime wedge in the glass too. 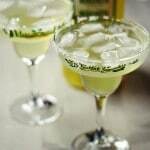 Pour the tequila, lime margarita mix and water into the glass and stir with a long spoon or stir stick. Finish with a lime wedge and serve!